for the United Jewish Appeal. being of the Jewish people. Karpay who eloquently introducted Wiesel. The study, directed by Dr.
"This is all very exciting,"
have a night to remember." Leaders who will assist them. tional Recognition Week June 12-16 in Washington, D.C.
sylvania in the fall. WAY TO GO! joined Adam Cutler in becoming National Merit Finalists. the University of Michigan. Very impressive! woman elected to the Hillsborough County School Board. Achievement and Saturday's Children. Congratulations! Marina and Ricky Vieco, and Karen and Michael Linsky. Two new kids on the block to tell you about. ..
New Jersey and Anne and Irving Seltzer of Ocean, N.J.
a great grandmother, Faye Nadell, of North Miami Beach. Israel," said Dr. Joseph P.
tion was presented to "Mic"
Israel, 40 Worth Street, Rm. senior partner of the Jacob D.
to Israel on June 29. 10021, or call (212) 879-9300. Let us help you get ready for your Seder! Holiday Puzzles. Games. Books. Tapes and NOW a bigger selection of Videos! Hebrew Clocks, Books, Children's items. Wedding, Bar/Bat Mltzvah Gifts. rent contributors to our annual community campaign. 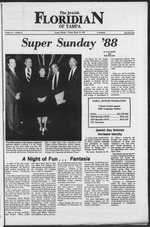 applications is May 15, 1988.
that the community will share our excitement. She is looking forward to seeing everyone for Camp '88! port when needed," he said. "quirk" is loyalty to Israel. need of lessons from anyone. After all, who is judging her? Kt -in .iln.tis rf)(M' VprU i*t.
Fir.M iiHiM-. firsi m rsc4. will be shown on Channel 3.
the B'nai B'rith Brandon Unit. the area. The "singles only"
Berger will address the group. in Israel and around the world. two months in the Israeli-controlled 'West Bank' and Gaza territories. ed to restore law and order. frustrations, understandable after so many years of occupation. care little about the human cost of continued rioting. suppression of violent mass rioting. ly. They've been mercilessly beating Arabs too. under strict instructions to use rubber bullets, water hoses and tear gas. rioters would have died during the first weeks of the disturbances. are free from jail thanks only to an Israel-PLO prisoner swap in 1985.
deportation of civilian populations from occupied territories.). population in the West Bank and Gaza. as a result of its victory in a war self-defense (the Six Day War of 1967). their inhabitants in a peace treaty between Israel and its neighbors. taken into account in any regional settlement. about effecting change with any Palestinians. commit himself to peace with Israel. has to talk with their leaders. stepped-up terrorist activity against Israel. number of Palestinians over the past forty years! camps. It doesn t care about their living conditions. to the removal and resettlement of Palestine refugees in the West Bank"
the Lgyptians, peace and order would be restored. Israel and Arab leaders over the West Bank. Saturday, March 26 at 11 a.m.
day evening. Dr. and Mrs.
pa Yacht and Country Club. Podis, son of Mr. and Mrs.
given by Ms. Beverly Fink, Dr.
Mr. and Mrs. William Wares. Mrs. Bernard Silver, and Dr.
To give you and your car a break, take Amtrak's Auto Train to the Northeast. And drops you off in Lorton, Virginia, which is just outside Washington, DC. Arrow Glass & Mirror Co. Contributors as of March 4,1988.
may have to be sought. parents off welfare, he said. then get a job, she said. out of the job market, she said. social services tend not to be." Horseradish and P*PP"v m,_tun: over asparagus. Jones Intertable TV Channel 12 Sundays, 8:30 A.M.
WPLP Radio 57 AM Sundays, 6-9 P.M.
time for freedom must come. May 1971, 17 years ago. ago is still being held here. plied to leave. So did my wife. democratization are not for us. be welcomed into the Temple. "You'd Have To Be Meshuga Not To Try Us"
mi Mantehewtu Wine Co.. topics. NY. with a night of dancing fun. night service just for singles. Alan live at 14550 Bruce B.
Israel, 301 59 St. N., St.
Singles to a Passover Seder. Linda in Pinellas at 397-4957. 5:30 p.m. Hostess is Marsha. Cults At Their Own Game"
call Lisa Bush at 875-1618. Vi less calories and no cholesterol, butterfat or lactose. mandatory. Must have own transportation. 28 *9 Incudmg boating, jJi* canoem|, kayak.ng. wate. JSZ staff 2 UN's and MO on prem.se, K^10"
Hrm wrvmj 3rd teneration of campers on 200 beautiful acres. above their grade level in every area. Hebrew up to a sufficient level. with deposit by March 22. FOOD SO GOOD PEOPLE TALK!!! Fridays of each month. Masonic Community Lodge, 402 W. Waters Ave. (at Ola). Friday. 8 p.m.; Saturday, 9:30 a.m.
Hauben Services: Friday, 8 p.m.; Saturday, 10 a.m. Daily: Minyan. 7:15. 3303 Swann Avenue 876-2377 Rabbi Richard J. Birnholz. Saturday. 9 a.m. Daily morning and evening minyan. 7:30 a.m., 5:45 p.m.
13156-A North Dale Mabry. Rabbi Yossie Dubrowski, Executive Director. 963-2317. 634-9162 Sun City Center Services: Friday. 8 p.m.. Saturday, 10 a.m.
studv discussion sessions. "Shabbat Experience," monthly services and dinner. (jet set for the most inviting climate anywhereThe Fallsview. One of a kind setting. Sunday evenings from 6 p.m.
than 30 years, coming from Clarendon, Ark. member of Congregation Schaarai Zedek. He is survived by his wife, Sylvia. and a member of the Elks Club of Tampa. Tamarac and Ruth of Anderson, S.C. Youth Group Advisor for High School youth. able. Contact: Dr. Zena W. Sulkes, R.J.E. Clearwater, FL 34624, Telephone 531-5829. YES! You name it we do it!! "Quality Cleaning At Discount Prices"
'Where To Go For Service and Help"
directly, or call the Tampa Jewish Federation. and crafts, drama, and playgrounds, etc. activities, but also by joining and supporting Tampa's synagogues, agencies, and organizations.